With hundreds of new apps making their way onto the App Store every day, it can be very difficult to get noticed in such a competitive space – especially if you’re new to the market and seeking instant visibility. By understanding and using paid search wisely within the App Store, it can help give you instant results and that immediate presence you’re striving for. Google Adwords offers an easy to set up and simple to manage solution that entices users to download your app straight away. Tailored ads – yes, relevant placements – yes. So for all those display lovers out there – is it the dream!?? But, let’s not run before we can walk here….. Google offers multiple campaign types and settings for apps, including Mobile App Installs, Mobile App Engagement, Ads in Mobile, Apps in Display, App Installs and App Extensions in Search….confused yet?! Don’t worry, we seek to explain and simplify so read on! 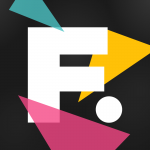 Focuses on getting users who have already installed your app to try it again. These work by showing ads within other apps. Currently app engagement campaigns on the Search Network are only available for Android app, not iOS. Focuses on getting users to download your app by showing ads within other apps/categories in the App Store. Focuses on reaching out to people who are currently using your app. Google give a great breakdown of the different campaign types to help you choose the right strategy for your business. This allows you to link your mobile or tablet apps from your texts. Here we discuss Mobile App Installs for the Display Network as this is the only compatible network type available for iOS apps. However, word on the street is that Google plan to release this campaign type on the Search Network too. So watch this space! Before you dive into setting up the campaign it’s crucial to do your research first – You wouldn’t book a holiday without doing your research so just apply the same principles to setting up a new App Install Campaign. The Display Planner will become your best friend throughout your research, launch and optimisation phases – so you are going to have to learn to love it! The DP (Display Planner) gives you a wealth of information about suitable placements for what apps you want your ad to show on, to whom and on what devices. In the campaign targeting at the top left hand corner of the DP – “Campaign Targeting” you can narrow down your targeting to iOS devices and apps. If your App has been built to be compatible with Android Devices, then you should choose this option too. Use a separate campaign for this as you will need to apply specific targeting, bidding and settings. 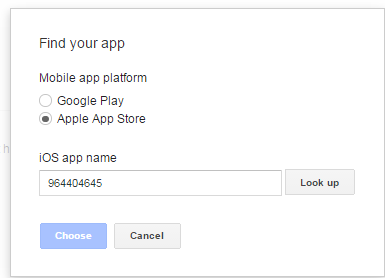 You can use the look up function in the Campaign Settings to find your app – nice and easy. So, once you have set your appropriate campaign settings you will need to apply your targeting methods. If you are unsure about the exact app placements, keep this on a broad category with a low bid. You will later be able to see where your app is performing best to refine it further. 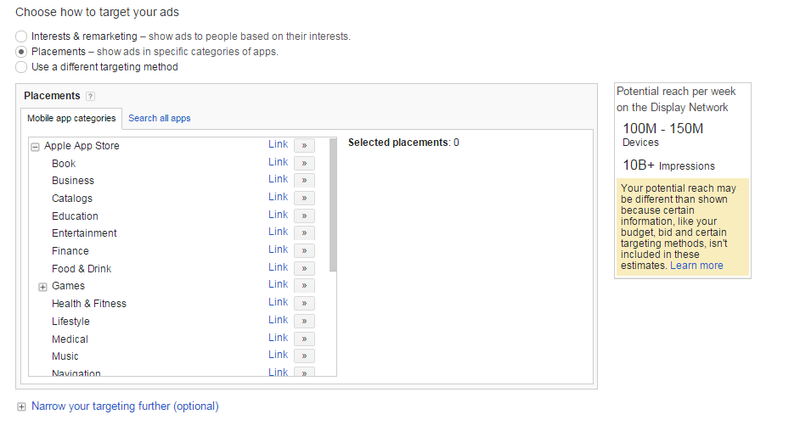 As we discussed earlier, you can target by the following: interests, placements and remarketing. So you have set your campaign up, applied the correct settings and made it as targeted as you require. Now it is time to create your ads. The sizes and specifications are exactly the same as a standard Display Campaign. As well as being able to track conversions in the Adwords interface – as you would with a normal search or display campaign, you can also track your app activity in Google’s very own Mobile App Analytics. This gives you a wealth of information including behaviour flow around your app and traffic sources. You can also track goal conversions and get real-time reporting. All you have to do is download the Google Analytics SDK. So what sort of results can you expect to see with a Mobile App Download Campaign? Your campaign results will vary from campaign to campaign. But if you are apprehensive about running a display campaign – then don’t be! Expect to see cheaper CPCs, better CTRs and better conversion rates than standard display on the GDN. App lovers are always looking for new apps to install on their phones and tablets – especially if they are free. So a Mobile App Campaign is the perfect solution to promote your app in this thriving mobile platform. So to summerise – To ensure you are achieving optimum performance, you must be concise with your set up, make sure you are targeting relevant people and on the relevant placements, and have ads that entice users to click through – and ultimately download!